Edward J. “Teddy” Fleming Jr.
in Woburn, August 27th, at seventy eight years of age. Beloved husband of Roberta C. (Watson) Fleming. Cherished father of Thomas E. Fleming of Winchester, Peter A. Fleming, his wife Amy and David P. Fleming all of Woburn. Dear brother of Carol Doughty of Woburn, Ruthi Maggelet of FL and the late Joanne Fleming. Devoted “Grampy” of Travis A., Evan P., and Caden E. Fleming all of Woburn. Funeral arrangements are under the direction of the Lynch-Cantillon Funeral Home, 263 Main Street, Woburn. Presently the arrangements are incomplete and will be announced later next month. Edward J. 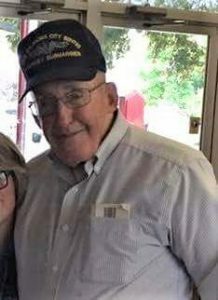 “Teddy” Fleming Jr. passed away at his home Monday, August 27th. The beloved husband of Roberta C. (Watson) Fleming, he was seventy- eight years old. Born in Woburn he was the son of the late Edward J. and Elsa M. (Paulsen) Fleming. Raised in the Horn Pond section of the city, Teddy was a graduate of Woburn High School, Class of 1957. Teddy went on to study at Bentley College where he received his degree in Accounting, which was his life long profession. He married Roberta, with whom he has shared over fifty years of marriage. They had three sons, who over the years kept them very active and busy. Squam Lake and Hampton Beach were places the Flemings enjoyed parts of their summer. As their kids grew, so did their family! “Grampy” was an extraordinary grandfather who loved spending time with his grandchildren. Always, no matter what was happening around him, if there was something needed by his grandchildren, everything stopped! He was right there with the hug, the laugh and the love! A true Woburnite through and through, Teddy always started his day at the counter in Cousin’s in Woburn and Frannie’s in Winchester, where he would catch up with all his local friends and keep track of all the Woburn happenings! For a good number of years he was quite active in the Woburn Elks and the Towanda Club . A hard worker, Teddy dedicated himself to his work of accounting and taxes. While he was working in Boston for a time, Teddy got involved at Children’s Hospital. Several times a week he would stop in and read stories to those children who were in need, and he loved it. Sadly Teddy was predeceased by his parents and his younger sister Joanne Fleming. He is lovingly survived by his wife of fifty three years, Roberta, his three sons Thomas E. Fleming of Winchester, Peter A. Fleming, his wife Amy and David P. Fleming all of Woburn. Dear brother of Carol Doughty of Woburn, Ruthi Maggelet of FL and the late Joanne Fleming. Devoted “Grampy” of Travis A., Evan P., and Caden E. Fleming all of Woburn. Funeral arrangements are under the direction of the Lynch-Cantillon Funeral Home, 263 Main Street, Woburn. Presently the arrangements are incomplete and will be announced later next month. I just recently learned of Mr. Fleming’s passing. During the summer months we often caught him sitting outside of his house, and our dog just absolutely adored him and whimpered to see him. He is missed, and our morning and evening walks will never be the same. Condolences to his family. To Teddy’s family: I cannot begin to tell you how very sorry I am for your loss. Ted was much more to me (and my family) than our “tax guy”. He was very dear to us and he and I used to chat on the phone fairly often to catch up. I spoke to him a few weeks ago and to know that was our last phone call is heartbreaking. I will miss him more than I can say. You have my deepest sympathies and condolences. May he rest in peace in the eternal love and light of the Lord. Peter & Amy and family, we are so sorry for your loss. Your father was a wonderful man. Our thoughts are with all of you. Dave,Arlene and I are so sorry for your loss.May God Almighty Bless and Comfort you,your Mom,brothers and the rest of the family in Jesus’ Name.Amen.We love you. Sincere condolences to Teddy’s family. He was a childhood friend of my Dad’s, Bob Andrews, and a dear member of the coffee crew at Dunkins. Blessings. He was a fine man, and good friend. Prayers and peace to all of you. Sorry Ruthi to hear of your brothers passing. Sending love and prayers to you Dave and family on the loss of your Dad! May he Rest In Peace and Peace find its way to all of you ! I’m so sorry to read this. Thinking of you all in this difficult time. Deepfelt condolences for the loss to your family.